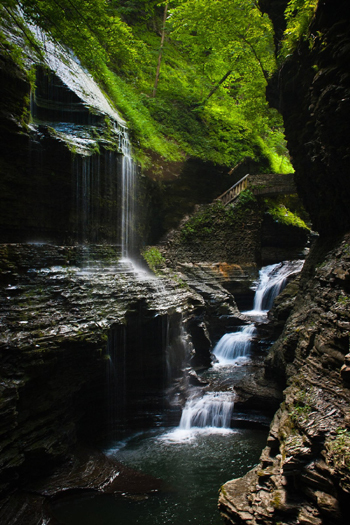 Custom photo mount of an original photo taken of Rainbow Falls, Watkins Glen State Park, New York. The image itself is 12″ x 18″ with custom photo mount that is made out of 1/4″ translucent plexiglass, 1/2″ black foam-core, and galvanized hardware. It is ready to hang with a wire in the back and it can also be back lit with a small fluorescent light. SHIPPING: Winner pays for and coordinates shipping with seller. I began taking photographs about four years ago when I purchased my first DSLR camera. Ever since, I have grown to really love spending time outdoors taking photos. I am a huge lover of the outdoors, nature and animals, so whenever I get the opportunity, I am shooting. More recently, I have been photography my friend’s children for portraits and I would love to expand into a business of portraiture and large events, like weddings. However, for now, I am content photographing landscapes and also painting abstract art. Read more here. Cassy has generously donated this beautiful photo to be auctioned off here at StubbyDog. If you want to place a bid, please do so in the comments section below the post.